Tom Hynes was born in Moycullen on 29th December 1878 and was baptised on 1st January 1879. His parents were Laurence Hynes (1859-1937) from Ower and Mary Bane (1858-1942) from Kilrainey. Tom was the eldest of 10 children, Mary (1881-1964), Bridget (1883-1970), Barbara (1886-1975), Anne (1887-), Flannan (1890-1956), Sabina (1893-1960), Laurence (1894-1920), James (1896-) and Michael Patrick (1899-). 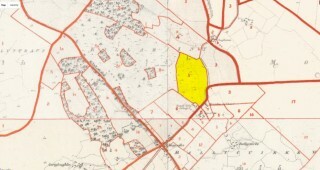 At the time of Tom’s birth his parents appear to have been residing with his maternal grandfather Thomas Bane in the townland of Kilrainey. 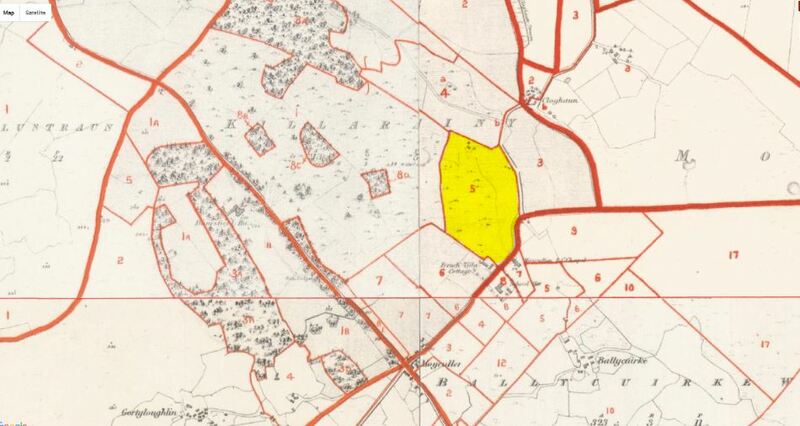 According to Griffiths Valuation Thomas Bane had house, office and lands leased from local landlard George E. Burke. Three further siblings were born in Moycullen and then in 1887 the family appear to have moved to Ower, Killanin following the death of his grandfather Thomas Bane on 20 December 1886. Tom had a hugely successful athletics career. 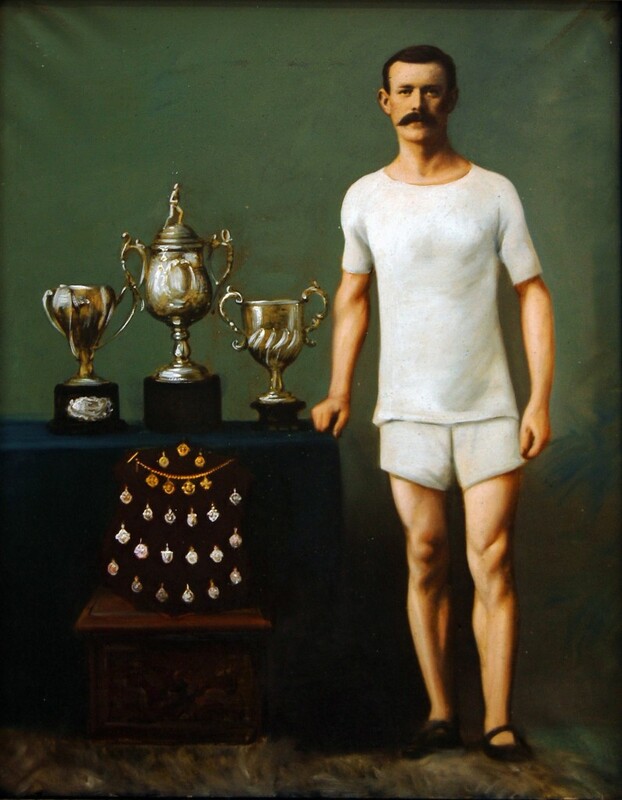 He distinguished himself by winning the first ever professional marathon run in Ireland, in Jones’ Road in 1909, and he retained the title the following year. He won major events in Boston and New York. He travelled regularly to Dublin to compete and about 1912/13, Tom Kenny from Craughwell introduced him to some men who turned out to be IRB men. They regularly gave him Sinn Féin pamphlets to distribute in Galway which he did. This brought him into contact with the Volunteers and George Nicholls and Seamus Carter. He joined the pipe band, Cumann Píobairí na Gaillimhe which was set up by George Nicholls and which was really a cover for IRB activity. He attended the meeting in the Town Hall at which Roger Casement and Eoin McNeill spoke for the purposes of forming the Volunteers in Galway. “After the meeting, a few hundred joined up but that was all that was heard of most of them”. In 1913, Seán McDermott swore him into the IRB. They were often involved in trying to disrupt World War I recruiting meetings even though they generally got beaten up themselves as most of the population were anti-Sinn Féin. In September 1915, there was a big recruiting meeting in the Town in the Town Hall. Tom worked in UCG alongside Professor Dillon at the time, and together, they made up about ten stink bombs. They got some Castlegar lads to smuggle these in past the heavy RIC security inside and outside the building. At exactly one minute past eight, Tom and Seamus Carter, guarded by John Hosty and Michael Kavanagh, cut the electricity wires about 75 yards away from the hall and blacked out the entire area. The stink bombs were set off and people walked on one another in their rush to get out. Some broke the windows to try and get fresh air. The hall could not be used for a fortnight. During the Rising, the plan was to take a few prominent men such as Martin McDonogh and Joe Young and occupy the Post Office, but due to the confusion between order and counter order, it did not happen. Tom was one of the few to escape arrest after the Rising. In August 1917, he was instructed to find a hall under the name of Sinn Féin to be used for the organisation and drilling of Volunteers. The auctioneer Amby Roche got him a big house on Prospect Hill which became known as The Sinn Féin Hall. He bought a billiard table, card tables and chairs, and as treasurer, he collected a lot of money from members up to the time the Tans burnt down the hall. They did a lot of drilling, field exercises and route marches and also held Sinn Féin courts. By Easter he was Quartermaster of the Galway Brigade and he organized a raid to destroy income tax and other papers in the Custom House. His job in UCG made him an ideal quartermaster as he had lots of hiding places there in cellars, lofts, presses, garages etc. He was also making hand grenades there. Whenever possible they would buy arms from soldiers, and they smuggled gelignite into the country. There were occasional raids on RIC barracks, but the main concentration was on destroying military stores such as barbed wire, hay, anything arriving for Renmore Barracks or Earl’s Island. The carriers of stuff like cigarettes were relieved of their cargo regularly until the military provided their own transport. By the end of 1920, most of the remaining Volunteers were in hiding or sleeping under hedges and bushes. Tom and Professor Dillon often slept on top of 15-foot high bookcases or presses in UCG library, and occasionally he and his brother slept in other departments in the college. Tom Hynes has a road named after him in Newcastle. Hi. I’m another cousin of yours, it looks like. Tom Hynes is my great-grandmother’s brother. My name is Lara Slough. You do realise that Tom Hynes was married twice and as a result Murt Hynes and Maureen Hynes were born. Murt worked in UCG for years in the physiology dept. Murt had 4 children…John, Orla, Tara and Tommy while Maureen had also 4 children..John, Michael, Michelle and Maura Finan. * Allyson of course turned out to be the granddaughter of Tom Hynes in the above article.